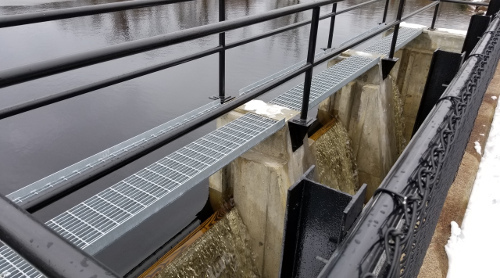 SA designed repairs, secured permits, and administered construction at Old Shepard Street Dam to restore the spillway and improve overtopping erosion resistance in the design flood. 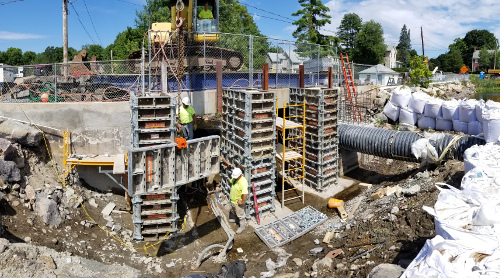 SA inspected, evaluated, and designed repairs to this 450-ft. long, 11-ft. high embankment dam that includes a concrete spillway built integrally with a bridge carrying Old Shepard Street over Massapoag Brook. 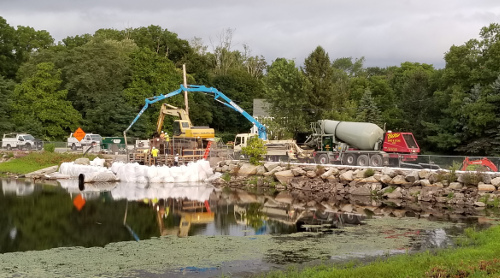 While the Dam releases through the spillway into Massapoag Brook, the impoundment has a second release; a diversion channel near the pond inlet that bypasses the Dam, resulting in a complex hydraulic system. The Dam previously controlled water for mill power, however it is now used primarily for recreation. The Project goals were to reduce risk of Dam failure and associated upstream and downstream impacts (i.e. 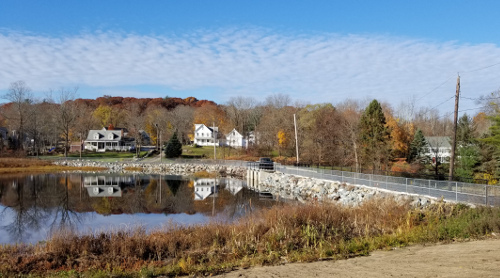 improve Dam safety), address deficiencies and requirements of the Massachusetts Dam Safety Regulations, repair and maintain the Dam, and to manage cost outlay to the Town. SA performed Phase I Dam Safety Inspections and evaluated repair/improvement alternatives, including performing subsurface explorations, concrete coring, laboratory testing and condition evaluation, and dam breach analysis. We evaluated subsurface seepage by finite element modeling and embankment and spillway stability. 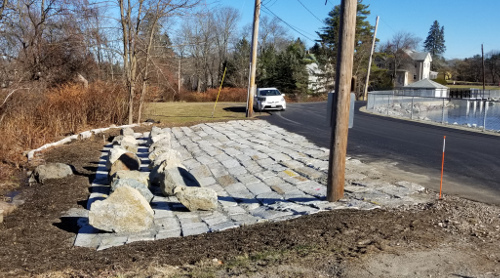 We designed embankment improvements to resist erosion during overtopping in the design flood, and replacement of the spillway and downstream stone masonry wall. SA prepared design drawings, an emergency action plan, an operation and maintenance manual, contract documents, and permit applications for the repairs, and assisted the Town during meetings with abutters and stakeholders and during project bidding. 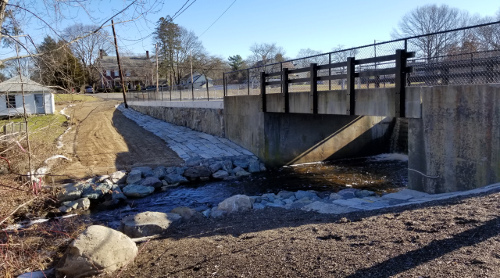 SA managed and administered the Project during construction on Town’s behalf, observing construction for conformance with contract documents, performing concrete and soil materials testing, documenting construction and reporting to Massachusetts Department of Conservation and Recreation, Office of Dam Safety (MA DCR ODS) to meet the Massachusetts Dam Safety Regulations. SA administered the construction contract, reviewed contractor invoices, negotiated change orders, and managed contract close-out.